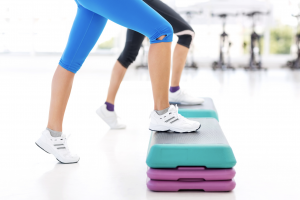 Step Up and Sweat is a step aerobics class that brings it all: balance, coordination and cardiovascular health. Music makes it effortless (well, maybe not quite…). Young knees tolerate more risers. Wear your heart rate monitor and get some high intensity work. Old brains need cognitive challenge. The choreography will put you to the test physically and mentally. The first two weeks of the fall and winter sessions teach simple choreography for new steppers. Register through Cape Elizabeth Community Services.